After four months of delays, the state-of-the-art Ambergris Stadium is finally approaching its official inauguration. Initially, a soft-opening ceremony was scheduled in November 2016, in honor of San Pedro’s 32nd Township Anniversary, but the ceremony was postponed due to inclement weather. 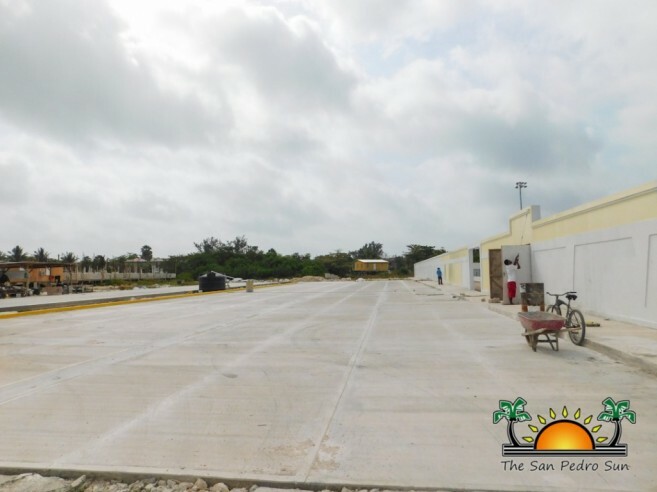 As a result, the $2.3 million project, coordinated by Belize Infrastructure Limited (BIL) in collaboration with the San Pedro Town Council (SPTC), and executed by AM Construction Company from the Orange Walk District, was delayed. However, the stadium is in its final stage of completion, and is now undergoing finishing touches for the official inauguration. General Manager Christy Mastry has confirmed to The San Pedro Sun that the stadium should be completed by the end of April. “We plan to be done no later than the end of the month [April 2017]. Then, BIL will be coordinating inauguration plans with Mayor Daniel Guerrero and the Area Representative of Belize Rural South, Honorable Manuel Heredia Jr. We will also discuss the handing over of the management once the project is delivered,” said Mastry. 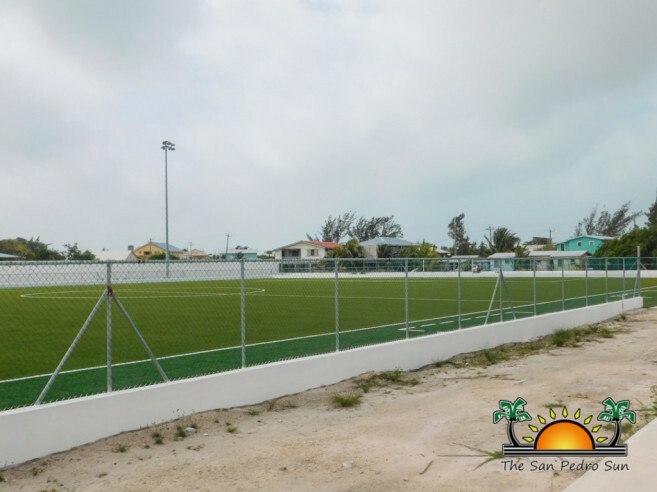 As the stadium is expected to transform sports professionalism on the island, some of its highlights include: a synthetic turf, stage lighting, bleachers, concession stands, lockers and bathroom facilities. According to Mastry, the exterior components of the project has been completed. 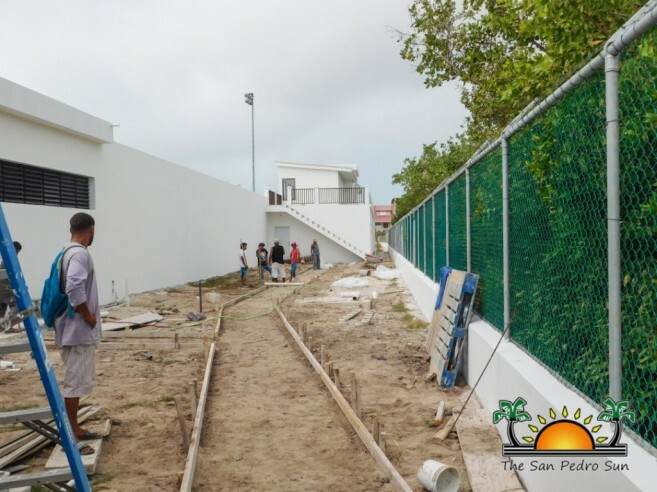 However, some civil work is currently being done to insert interior cabinetry for the locker rooms and install final electrical work on the second floor, which will be for the VIP area/media booth, and the sidewalk and parking lot area is being casted. Mastry explained what caused the delay of the project. “We had a couple of issues with the contractors slowing down and not having as much staff out there. So BIL got involved, along with myself, and we made sure that we put the project on hold until we had the proper crew that were qualified to do what we wanted back on site. However, nothing has changed in the design. We just had a few delays that pushed us back. We’re moving forward, and expect it to be fully completed soon,” said Mastry. However, BIL did not explain if the additional crew requirement falls within the indicated budget, or if it resulted in additional construction costs. In addition, BIL is also trying to isolate the drainage of the field onto the lagoon. Mastry said that even though the drainage worked perfectly fine during Hurricane Earl last year in August 2016, the surrounding area is low, and is prone to flooding. BIL is currently working to insert pipes and install a proper drainage system that will avoid the accumulation of water on the streets nearby. Mastry is eager for the stadium’s completion. “I look forward to the use of the stadium. Since San Pedro has the attraction to host regional and international teams, I think it might it will be a great opportunity for the island. It will also become a great economic driver because it will be able to make enough money to help with the development of the youth on the island,” said Mastry. Mayor Guerrero, along with Hector Alamilla, Councilor in charge of Culture, Youth, Sports, and Leisure activities, look forward to hosting the most prestigious games in San Pedro Town upon completion. No plans for inauguration have been finalized, but the SPTC is seeking to make the ceremony a memorable experience for islanders and visitors alike.